I previously shared video of Pedro Torres and the stallion Oxidado doing Working Equitation. Their partnership, to me, is obvious and inspiring. Recently I ran across an interview with Pedro, where he talked about his inspirations and philosophies. Within the interview was a passage that particularly resonated with me, where he explained a bit about how his partnership with Oxidado developed. His account reflected my relationship with Dani. Back then, I was used to horses that needed a little pushing. When we’d run into an issue, and I’d try to push Dani, she would fight. It was after a near wreck from one of these fights that I realized I had to find another way to work with her. In developing my partnership with her, I developed a whole new way of looking at training horses, and a new “tool kit”. More on that another time. For now, let me leave you with a little more Pedro and Oxidado. This video is from a tribute to the lovely and successful Oxidado. 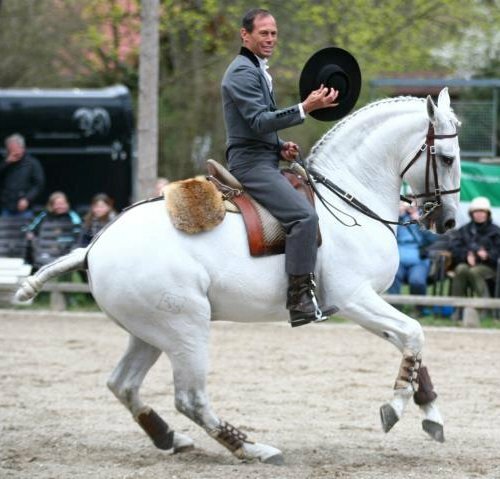 You have to wade through a little “talking” head stuff in the beginning – but you will be well rewarded with some lovely quadrille, then a demo ride by Pedro and Oxidado (with real human obstacles), followed by a bit more group riding. And then, because you know I love watching horses play, especially with their humans, there is this. Be good to your horses … and listen to what they’re trying to tell you! This entry was posted in Horsemanship, My Journey and tagged communication, Dani, horsemanship, learning, listening, Oxidado, partnership, Pedro Torres, personality, strength, training, trust, video. Bookmark the permalink.